Received a Complaint? Summon Your Insurance Company! 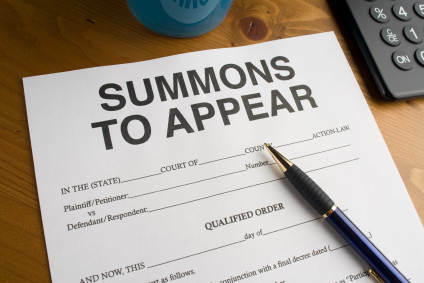 Receiving the Summons and Complaint when a lawsuit is filed can be unsettling. Many times a policyholder will call their insurance company or agent in a panic, wondering what to do. But notifying the company or agent is exactly what you should do: let your company or agent know you have received the Summons and Complaint so they can respond appropriately. It is essential the Summons and Complaint is forwarded to your insurance company immediately. Courts allow only a certain amount of time for an answer to be filed. If you fail to notify your company of the suit, a default judgment could be handed down giving the party who filed the lawsuit exactly what they demanded. There will not be a chance to present your side of the story, nor will there be an opportunity to dispute the amount of damages. There’s a chance a large amount will be awarded, perhaps even more than the amount of insurance coverage available. Worst of all, failure to notify your company could result in the denial of coverage which would have been available if the claim was reported promptly. Once your insurance company has received the Summons and Complaint, you should hear from your claims handler either the same day or the following business day if the documents arrive late in the day or after the office is closed. If you do not hear from someone within a day or two, give your insurance company a call. The first thing your claims handler will do is what I consider to be one of the best parts of my job: reassure you that they are on top of the situation, outline what to expect, and answer any questions you might have about the process. While your company will strive to settle all claims owed as quickly as possible, from time to time the other side is either unwilling to admit their own liability or has unrealistic expectations and a lawsuit will result. These suits are often resolved long before the case goes to trial. Sometimes there is a concern the damages claimed or awarded will exceed the amount of coverage on the policy. When this is the case, your company will defend the suit, but will notify you of the potential for an award that exceeds the coverage. You can retain a separate attorney to help defend your uncovered exposure if you wish. Unfortunately, there are occasions when your company may find the allegations in the Complaint are not covered by the policy. They might need additional time to investigate the situation prior to making a coverage determination. Depending on the policy, the specific allegations, and local law, the company may still provide a defense, but will place you on notice of the coverage problems in a document called a Reservation of Rights or a Non-Waiver Agreement. If none of the allegations are covered, or if the loss falls outside your company’s coverage period, they might have to send a denial; however, if the Complaint was sent immediately, there should still be time for you to respond within the time limitations set by the Court. Have you ever received a Summons and Complaint? How did you handle the situation and how was it resolved?